I kicked off my PhD studies by extending the Xth Sense, a new biophysical musical instrument, based on a muscle sound sensor I developed, with spatial and inertial sensors, namely whole-body motion capture (mocap) and accelerometer. The aim: to understand the potential of combined sensor data towards a multimodal control of new musical interface. Together with team colleagues Baptiste Caramiaux and Atau Tanaka, we designed a study of bodily musical gesture. We recorded and observed the sound-gesture vocabulary of my performance entitled Music for Flesh II. 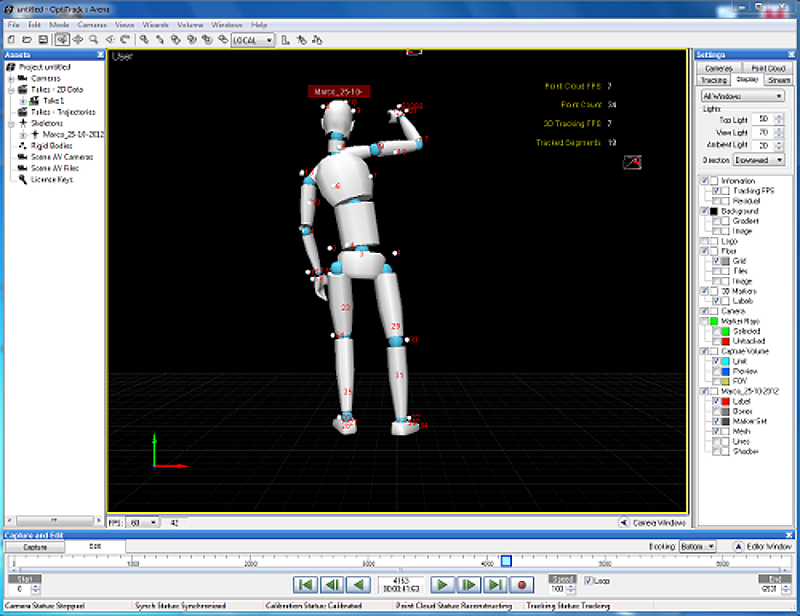 The data recorded from the gesture were 2 mechanomyogram signals (MMG or muscle sound), mocap data, one 3D vector from the accelerometer, and 3D positions and quaternions of my limbs. We created a public multimodal dataset and performed a qualitative analysis of those data. By using a custom patch to visualise and compare the different types of data (pictured below) we were able to observe complementarity of different forms in the information collected. We noted 3 types of complementarity: synchronicity, coupling, and correlation. You can find the details of our findings in the related Work in Progress paper, published for the recent TEI conference on Tangible, Embedded, and Embodied Interaction in Barcelona, Spain. The software we developed to visualise the multimodal dataset. To summarise, our findings show that different type of sensor data do have complementary aspects; these might depend on the type and sensitivity of sensor, and on the complexity of the gesture. Besides, what might seem a single gesture can be segmented into sections that present different kind of complementarity among the different modalities. This points to the possibility for a performer to engage with richer control of musical interfaces by training on a multimodal control of different types of sensing device; that is, the gestural and biophysical control of musical interfaces based on a combined analysis of different sensor data.